Raniera Rewiri (Te Whakatohea, Tūhoe, Te Arawa and Ngāpuhi) is proud to be both Māori and vegan and considers his journey to be about finding the connections between the two and how it can contribute to the wellness of tangata Māori, whenua and Māoritanga. He is driven by hauora, self development, learning, supporting rangatahi Māori, being in nature and cooking/eating healthy food. His passion for personal growth is one of the main factors that to led his journey to become vegan which he openly shares on social media. Though he never set out to be a social media influencer, the followers came, drawn to his journey, and his following has now grown to over 17k people. Public response to his online content has been positive with words of encouragement and amazement often found within the comment section. Raniera is now well known for his motivational preparation talk on Facebook and Instagram. He has also teamed up with his mum, Huia. to create their own food business called Tupuānuku as a vehicle to share his passion for improved wellbeing through plant-based kai. Through Tupuānuku, Raniera has also released an e-book titled Tupuānuku Eating Guide. This book gives an overview of veganism through a Māori perspective and how a plant based lifestyle impacts the human lifestyle. It also includes simple everyday recipes, shopping lists with money saving hacks and a four week meal planner. One of the key ideas that Raniera portrays is veganism through a Māori lens. He describes an alignment between te ao Māori and a plant based diet with a key link between the two being the connection with the environment. He explains that it is our obligation as Māori to protect our land marks and one to do this could be to choose not to consume dairy and meat products. Although none of his mahi explicitly uses the terms food sovereignty and food security, some of it can be considered as food sovereignty or security initiatives. 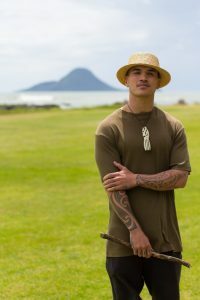 Raniera will be joining us at the Toi Tangata Hui ā Tau 2019, forming part of a team of panelists for Intertwine the Kumara Vine, where he will be sharing his experiences, kaupapa and insights on Māori well being.